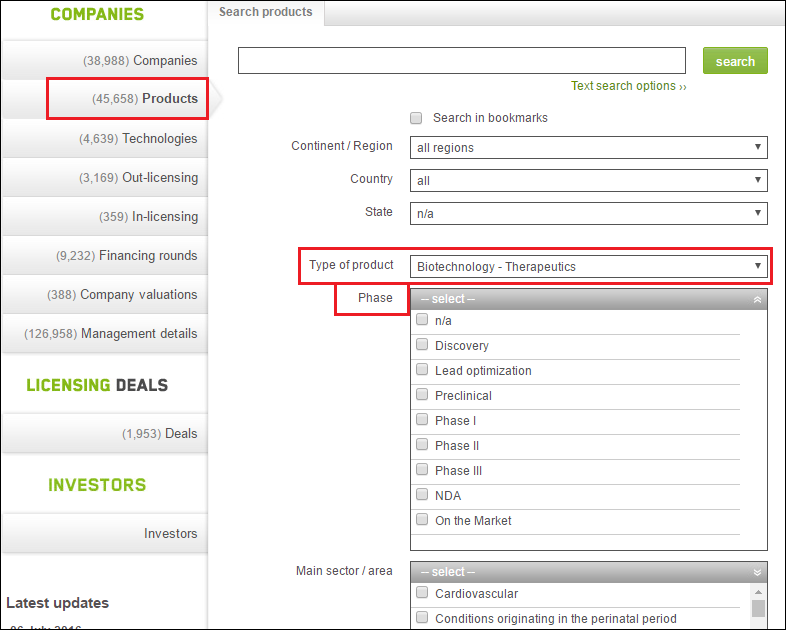 A powerful feature of the Biotechgate database is the ability to quickly find products at any stage of development. Whether you’re searching for an early stage product in Oncology or a product that is now on the market, you can identify your target in just a couple of clicks. Simply go to the product section of the database (or the licensing sections if relevant), choose your type of product and then select the phase from the drop down menu. After the phase is selected the search engine enables you to make further selections such as therapeutic indication etc. Once your search is complete you also have the option to save the search and set up an email alert. Biotechgate will then notify you of any changes in development or if a new product that fits your criteria is added to the database. For more information on how to do this you can read our article ‘Why the “Email Alert” Function is One of Biotechgate’s Most Powerful Features’ here. You can also request a demo or free trial of the Biotechgate database here.